Panda Tots classes have been developed from our massively successful Little Dragons programme, and are great fun all whilst encouraging confidence, co-ordination and cognitive development. 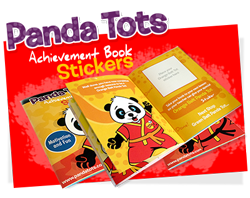 Children are rewarded for their efforts each week by receiving a sticker to stick in their special Panda Tots sticker book. After every 6 stickers children then gain their next coloured 'belt' sticker and also receive a coloured wristband, echoing the grading system in martial arts. Classes are £6.25 per week, and if you join you will need to purchase your child's 'Panda Pack' (£20), which consists of their Panda T-shirt and Achievement sticker book. This is my first visit - what do I need to know? Thank you for booking to come to our fun & fab Panda Tots classes! Classes are held at our Team Black Belt Dojo and you will need to come around 10 minutes early to your first class. Both you and your child should wear comfortable clothing, and a (plastic) bottle of water or similar is advisable. At the end of the lesson, if you would like to join the class you will be given the option to buy your Panda Pack (T-shirt & Sticker Book) ready for next week (£20 cash/card), and once back home you will need to book and pay for your place for the remainder of the term via the booking site HERE. We will only hold your place for 24 hours, so please make sure you remember! If you are a Facebook user, please 'Like & Follow' our page, for instant updates and news about our classes. How do I check class dates or times, &/or make a payment? 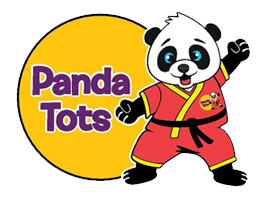 Panda Tots runs throughout Solihull school term times, apart from the weekends either side of a school holiday. When we open bookings for the next term, (around the last couple of weeks of the previous session), we will forward you an email invitation to pay for that period and will hold your place for you in the meantime. If you have not paid for your place within 1 week of receiving your invitation, it will be assumed that you don't wish to continue, and your place will be made available to other children. Please email Helen HERE if you are having difficulty meeting that deadline on any occasion. Can I book for less than a full term? Other than if your child is leaving, you must book for all of the available weeks in the booking period in order for us to keep your place for you. If you wish to leave the class before the end of the booking period, please email Helen HERE before responding to your booking invitation, and she will amend your records and send out a revised booking invitation for you. My child has missed a lesson through illness/holiday, can I get a refund? Due to the fact that we have a limited number of places at Panda Tots, you are paying for a PLACE during any given term, rather than individual lessons. This means we WILL keep your place safe for you if your child is absent. I can't make my class time this week, can I swap class? We're quite happy, if, occasionally you need to come to another class that we run, but unfortunately we can't let this happen regularly as we do try to keep class numbers tightly controlled to ensure classes are safe and enjoyable. What do I need to know about promotional pictures of the class? As you will have seen from our Facebook page and YouTube channel etc, we do, from time to time, take pictures of the class to help promote it and keep it thriving, but children are never identified unless we are given express permission by the parents. If you are not happy with your child being featured, please let us know at the time you see us taking the footage, so that we can work around you. I would like my child to join Team Black Belt's Little Dragon classes now they are 5yrs old, what do I do? Being a Panda Tot is a brilliant introduction to our karate school classes, but there is no automatic induction from the Panda Tots, as they are a 'stand alone' class offered by Team Black Belt. If you would, however, like your child to join our Little Dragons classes, please pop over to our Join Us page here, and apply for a place via the link. Children can start in Little Dragons from the age of 5yrs, but there can be a waiting list of 6 months, so do apply as soon as your child has reached around 4.5yrs. If your child moves to Little Dragons they will have to leave Panda Tots, but if they just wish to remain in Panda Tots they can stay until the term of their 6th birthday if they want to.